Constructing a sales education system that is measurable/predictable, where all salespeople are trained with the same method. 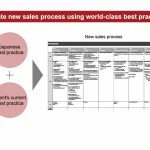 In most Japanese firms, salespeople learns the sales method from top salesperson or senior salesperson by “accompanying training”. 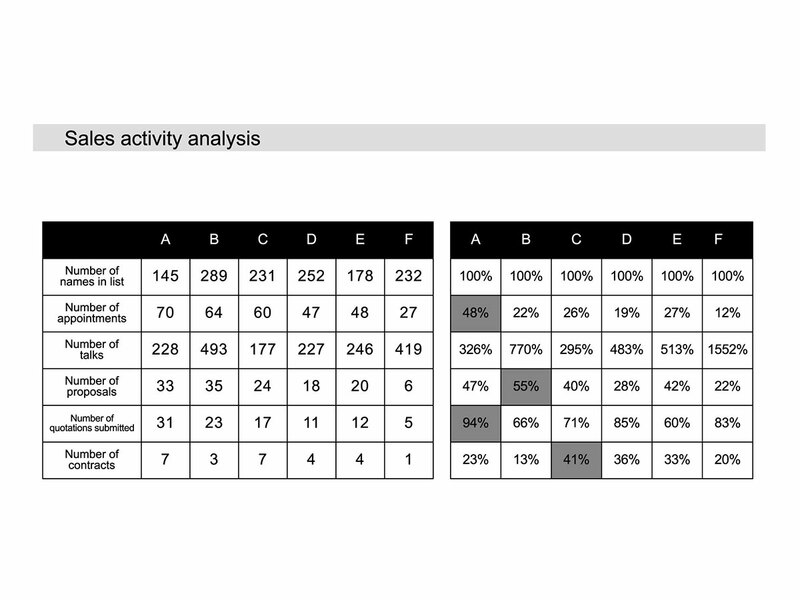 Salespeople which achieve high sales number, or salespeople who are likely be picked on the education team, more or less integrated their individual abilities into their sales activity. Examples include, energy, a bold personality, social skills which exceed normal people, or an outstanding communication ability, etc. Possessing special abilities is a wonderful thing, however, from the human resource education perspective, the ideal sales method became different depending on the “accompanying person”. Moreover, if the salesperson possess different abilities to the accompanying top salesperson, he could not make use of his strong points and could feel discouraged. 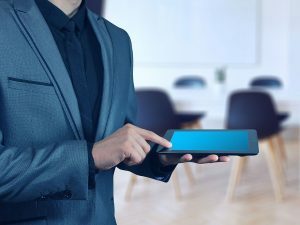 In order to create excellent sales achievement, demonstration of the best practice by the company without relying on “accompanying training” is important. 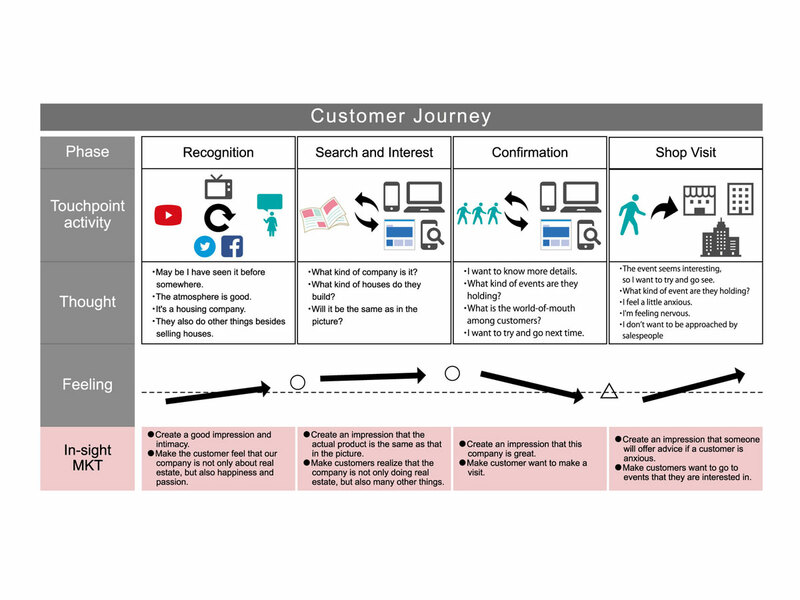 Customer journey shows an overview of the steps customers go through when purchasing the product. 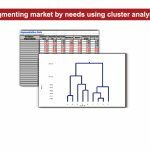 By clarifying the customer journey, organizing the suitable sales approach towards the customer during each process and conducting sales activity which prioritizes the customer’s needs become possible. Moreover, sales activities, which have the tendency to become on-the-spot actions, could be improved from a wider perspective. By designing the sales process according to the customer journey, a “support-type” sales process which aligns with the customer’s needs could be designed. When the customer journey and sales process match, the customers will not perceive their relationship with salespeople as opposing “buyer” and “seller”, but as cooperative “partners” proceeding through the purchase step together. Set indicators to determine whether the sales leads’ needs are answered, or whether sales leads desire a proposal. One widely used indicator is BANT, which is taken from the first letters of Budget, Authority, Need, and Timing. 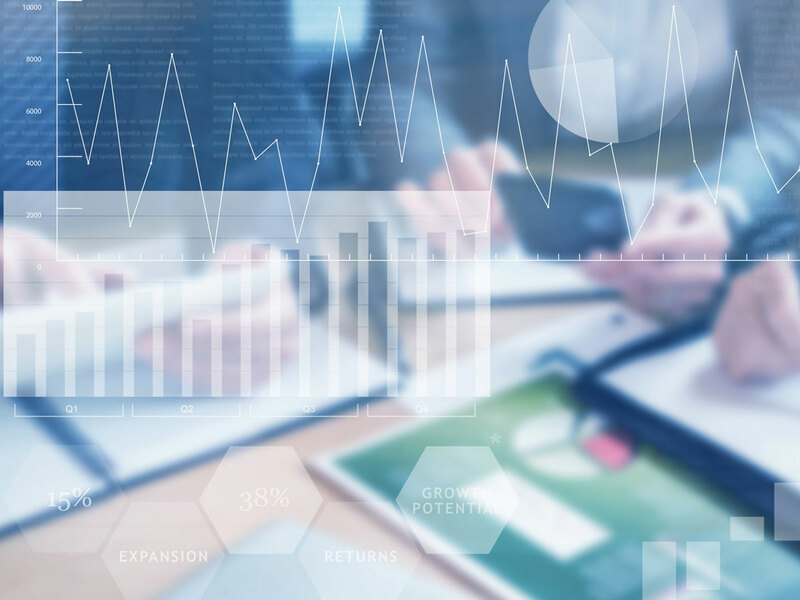 BANT is only one such indicator, and by setting the indicators which narrows down sales lead and gathering indicators from different steps of the sales process, the sales precision could be increased. 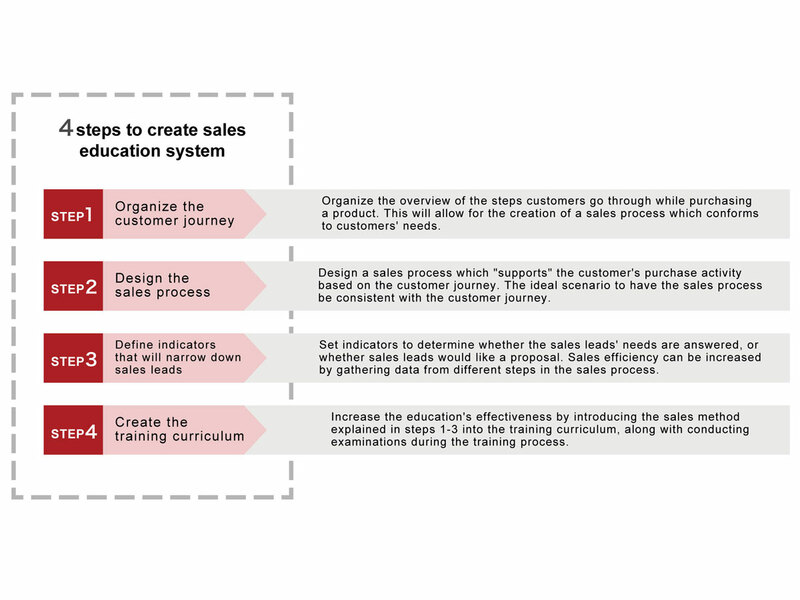 When the sales method is determined, reflecting it into the curriculum is relatively easy. Firstly, training for each component of the sales method (customer journey, sales process, lead-narrowing indicators) are conducted in order to make salespeople understand the overall picture of the sales method. 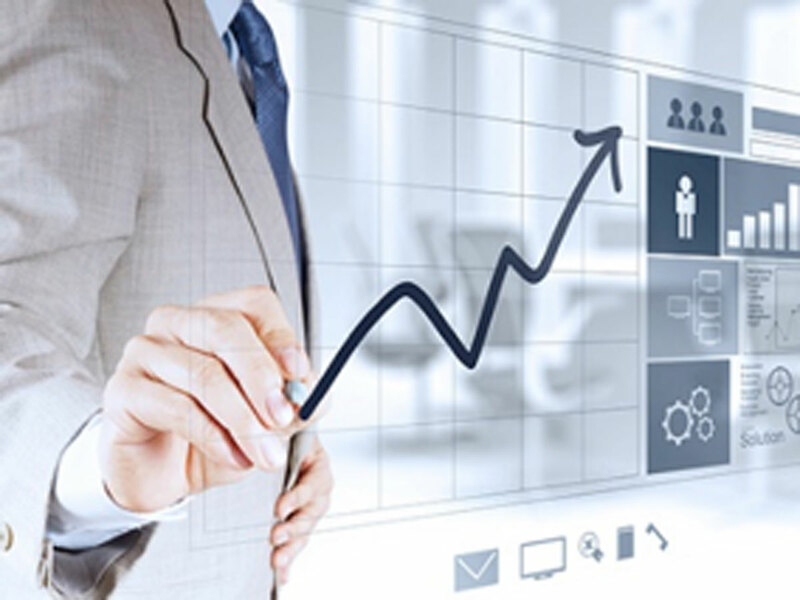 On top of that, individual training for each steps of the sales process is also conducted in order for the smooth acquisition of sales method. In order to confirm whether the sales education system is functioning effectively, test and examination are prepared, enabling the program’s effect to be measurable.